I have never purchased anything off a TV commercial like the ones the spokes people always tell you to call now for. Most of the stuff they peddle looks like junk to me. 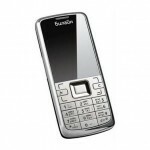 The company behind some of those oddball products — Telebrands — has announced a new gadget that works with mobile phones. The device is called the Jupiter Jack and plugs into the headphone port of mobile phones. The idea is that the device will send the audio from your calls over the cars speaker system so you can hear while driving without having to hold the phone. The issue I see with the device is that it only broadcasts on the 99.3 FM frequency. If you happen to live in an area where there is interference on that channel of someone broadcasts on the frequency you are out of luck. The device is available in several retail stores for $19.99. 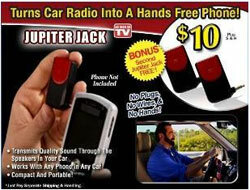 Interesting enough the Jupiter Jack was one of the last products Billy Mays made an infomercial before he passed away. The company was deciding whether or not they would air the infomercial for it. It looks like they did. The jupiter jack DOES work. and it has 2 settings 99.3 and 101.3 Chris, you do NOT need the station to be broadcasting. In fact it is best if it is a dead station. I have tried it on both stations and it works great. 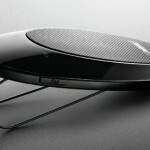 I would recomend it to anyone that wants an inexpensive way to have hands free. Also it will work in your house or with an mp3 player!!! I need help. I bought the jack yesterday, used it once, and now my phone won’t work! I’ve unplugged it, charged my phone, and now there is no sound at all. I can call out but no one can hear me. I get phone calls, but they can’t hear me and I can’t hear them. If I do talk they can hear me with all sorts of background noise. Also, when I talked yesterday with the jack, they couldn’t hear me very well unless I was holding the phone which defeats the purpose. Can anyone help me? and trying to trick them into buying other items not related. and i guess since i didn’t order the jewelry i wasn’t sent the correct jack. tomorrow i will go to Walgreens where the jacks were purchased and also complain to them about your procedures.i am a disabled vet and senior citizen and alsdo am writing to the aarp and vetwerans organizations about your scam. This product looks like complete twaddle in my opinion, but wait, thats not all I think its crap as well ! !